An artists' resume is one of the key factors not only in potentially helping to sell artwork, but also in getting grants, residencies and awards, as well as attracting gallery and collector attention. In tonight's webminar I will cover a variety of proven tactics for building your resume quickly and easily. 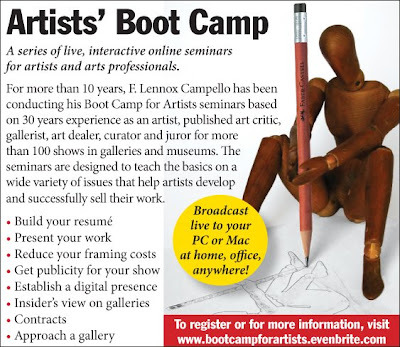 The tactics are applicable to new Art school graduates, emerging and mid career artists as well as those starting a new career in the visual arts after retiring from another career. Click on the image below for more info. The webminar starts at 7PM and there's a 50% discount on the prices. Boston's Center for Latino Arts (CLA) Gallery is now accepting portfolio submissions for solo and group exhibitions of contemporary art for its 2010-2011 season. Participating artists will be selected by the CLA Curator, and one of four 6-8 week shows will be awarded to qualified and relevant artists whose proposed works are closely aligned with their mission and goals (see below). Artists working in any number of mediums are eligible and encouraged to apply; suggested mediums include painting, drawing, photography, sculpture, digital media, video, new media and installation. Exhibitions will be scheduled between September 2010 and August 2011. The CLA Gallery presents contemporary works that are unique and innovative in concept and presentation. The CLA Gallery will provide promotional flier design, printing and distribution for each exhibition in addition to extensive listings and press releases. Each artist is responsible for providing finished works for awarded exhibitions, to include framing and/or other gallery presentation materials (for new media and video, this includes monitors, projectors and other devices inherent to the presentation of the work). - 250-500 word Statement of Purpose explaining why you would like to exhibit at the CLA Gallery and how your work furthers their mission.